Unity Middle College High School will open in the Fall of 2017 at 1310 East Lincoln Ave., in Orange, with 100 9th and 10th grade students. They are offering free college courses for all their students. 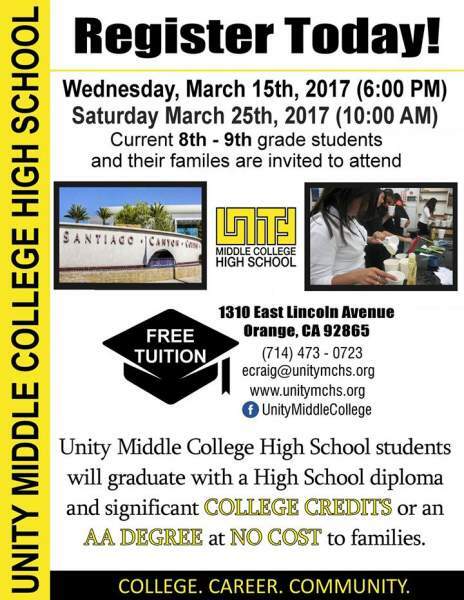 Unity Middle College High School students will graduate with a High School diploma and college courses that may include an AA degree. They are currently accepting intent to enroll forms online. Come to their March informational sessions on March 16 at 6 p.m. and on March 25 at 10 a.m. Unity Middle College High School is a full-time, tuition-free public charter school that will prepare all students for four-year university success, leading to professional careers through a blended high school and college curriculum. Students from all diverse backgrounds and communities are welcome to apply; at UMCHS, there is no discrimination as to race, ethnic origin, religion, or socioeconomic status. Call (714) 642 6624 if you have any questions or send an email to ecraig@unitymchs.org.